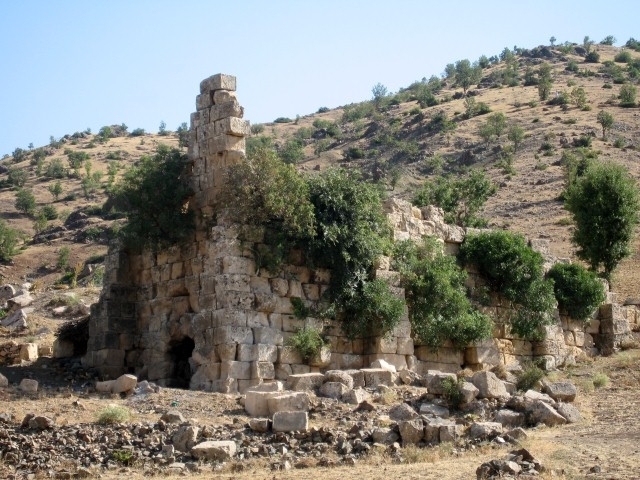 The first detailed site work concerning these edifices/areas was carried out in 2008. When in 2009, the management plan borders were officially defined, the data obtained the previous year was updated through a site visit, and systematic information was gathered on necessary themes based on a control list developed for the management plan. Borders of these areas were marked on cadastre plans or basemaps. In settlements in close proximity of the cultural edifice/area being examined, interviews with voluntary stakeholders, i.e. 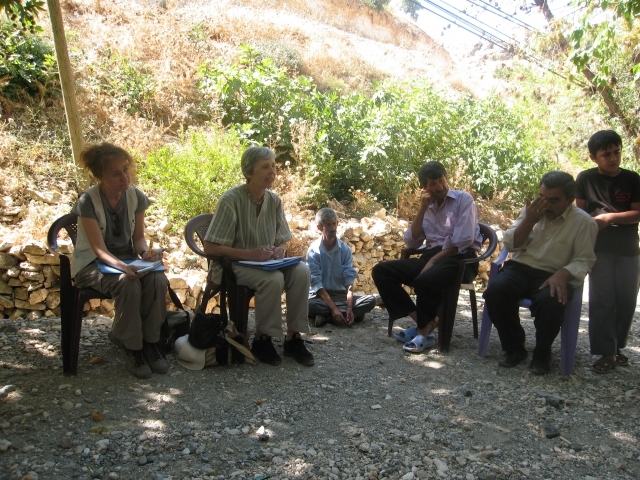 village headman, teachers, imam, were conducted, which were audio-recorded and photographed. 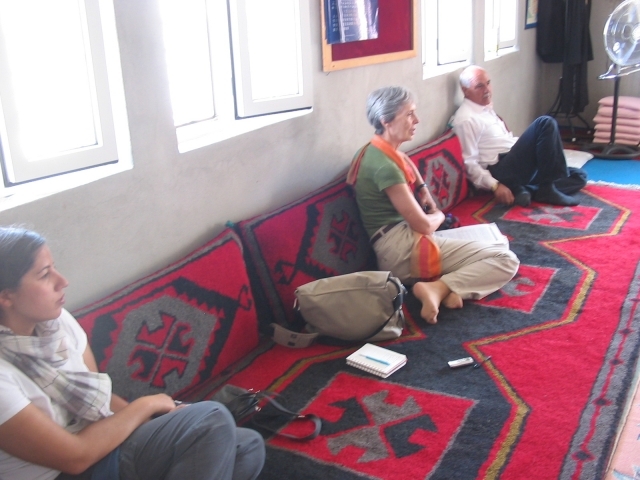 Field work of 2009 was audio-visually recorded by METU-GISAM (Audio-Visual Research and Production Center) to produce a documentary about CNCDP working process. 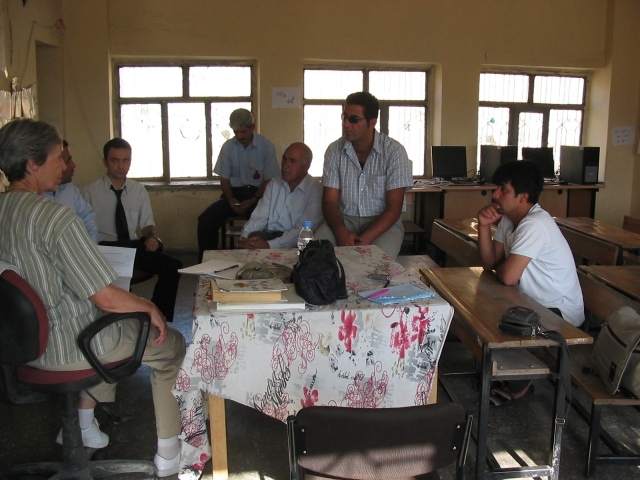 Management Plan studies were carried on in two groups: literature researches and site survey studies. 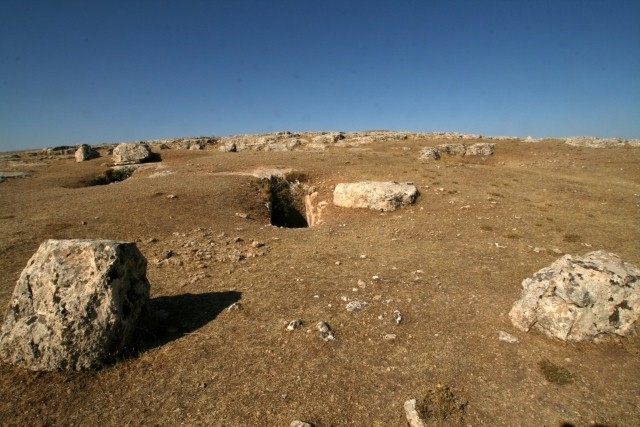 Within the context of literature researches, the history of the site with its surrounding, archaeological and architectural properties and the natural environment are studied. As a result of the literature researches conducted at the administrative institutions, the legal and administrative status of the area, ownership statuses, site protection decrees and all previous development and protection planning studies are compiled. 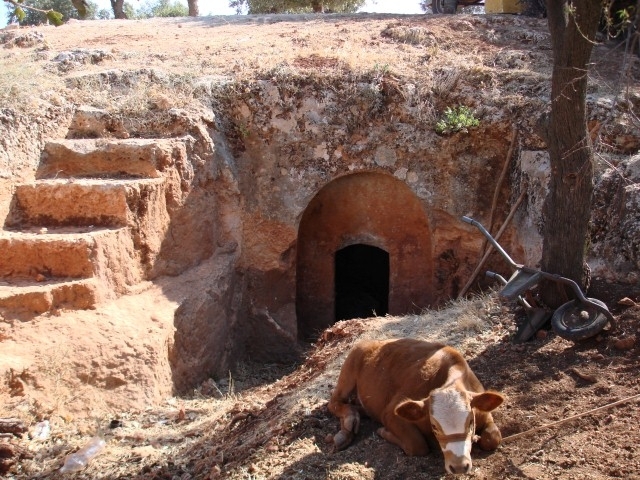 The site surveys, conducted in 2006 and 2008, provided the documentation of the architectural features of the assets and/or places. The site surveys are conducted by three groups of three-five specialists in architecture, conservation, archaeology, history of art, urban planning (participatory planning). 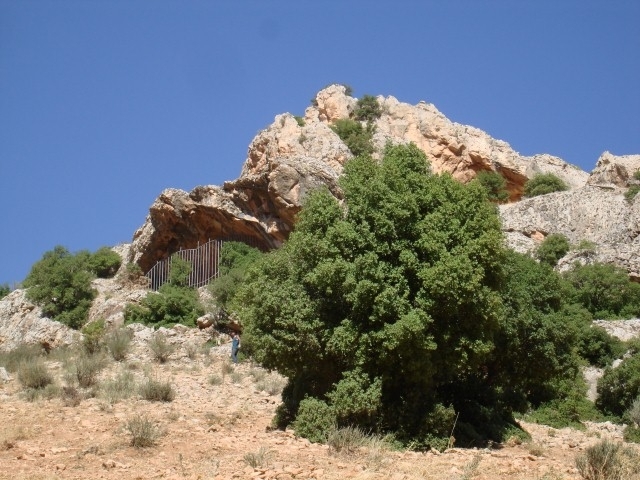 The study consists of determination of the problems, values and potentials of the site and its vicinity. In addition to this, the Social Planning Team gathered and evaluated the information compiled from various stakeholder meetings together with the data prepared during the Management Plan studies. 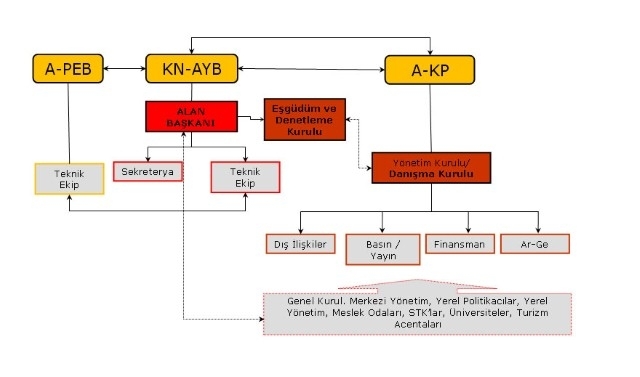 The information and documentation obtained during this work, which will be the basis for the implementation are carried on using the 1/5000 scaled cadastral maps and the 1/5000 scaled actual maps procured by Adıyaman Governorship and the final proposals are shown on these maps. 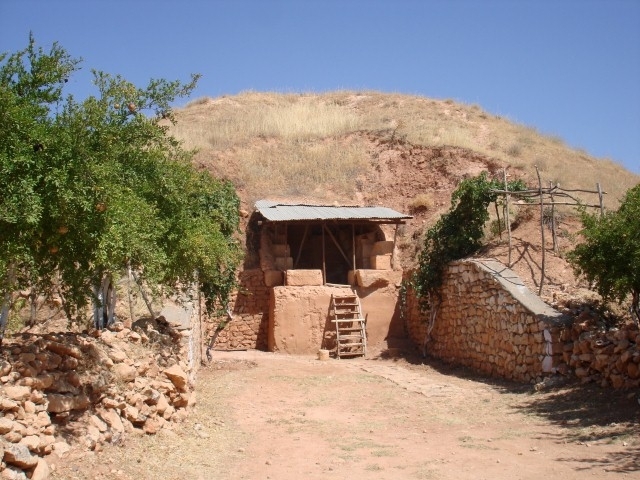 Finally all the studies and documentation are compiled and reported by five specialists within the CNCDP team and the Management Plan including the 15 places within dıyaman Province is prepared. 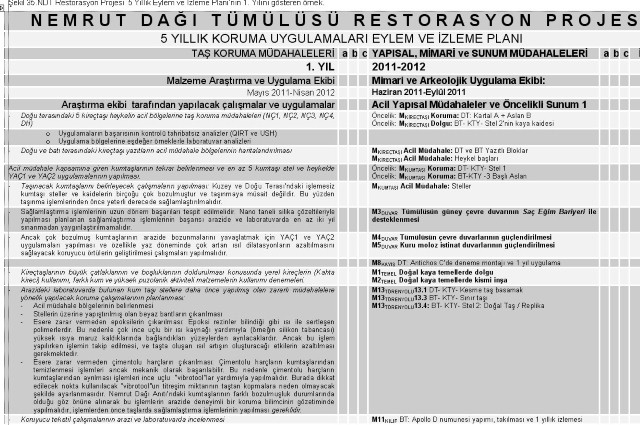 All reports are completed and submitted to the Ministry of Culture and Tourism in November 2010. Importance of the place for the inhabitants today. The existing use and other values of the place like education, entertainment etc. All fifteen places are evaluated considering their different features, different values (thus, within different sub-titles). In this study, the advantages of the place, the weaknesses (lack of financial sources, lack of man power, physical deteriorations etc) and potentials are considered. The factors that may be considered as opportunities which may contribute to the sustainable development, conservation and use of the area, and the obstacles/threats (insufficient conservation status, lack of security, lack of maintenance, lack of finance, vandalism etc.) are examined. In order to attain the basic strategic aims listed above, strategy tables are prepared and the projects and their targets are defined. 6. Priority areas of strategic intervention. The proposals for the initial projects which will help diversify the touristic services and income resources to approach the defined vision and strategies. 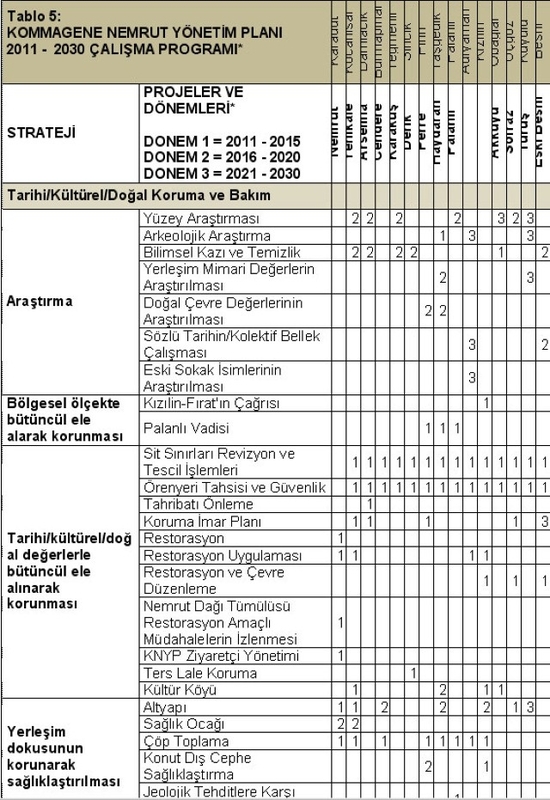 The evaluations studies are submitted to the Ministry of Culture and Tourism in December 2010. 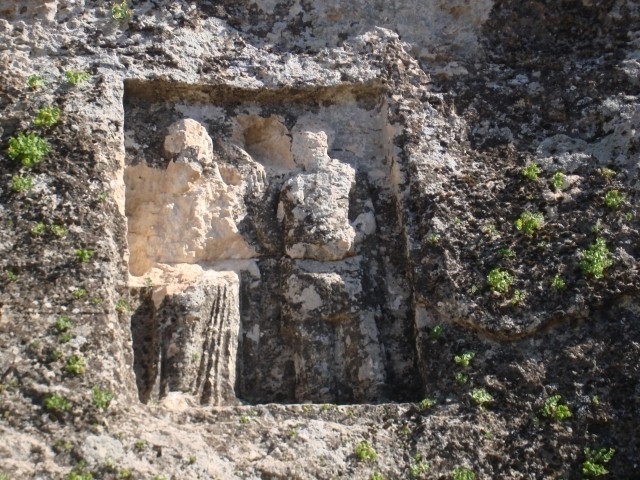 Commagene Nemrut Management Plan (CNMP) adopts the main principles as conserving and continuing the geographical, natural, historical, cultural, social integrity, and defines conservation as a regional fact starting from Nemrut. The plan also considers conservation as a part of the development procedure of the local community, thus it is prepared with the participation of all stakeholders who will have their contribution to the process. 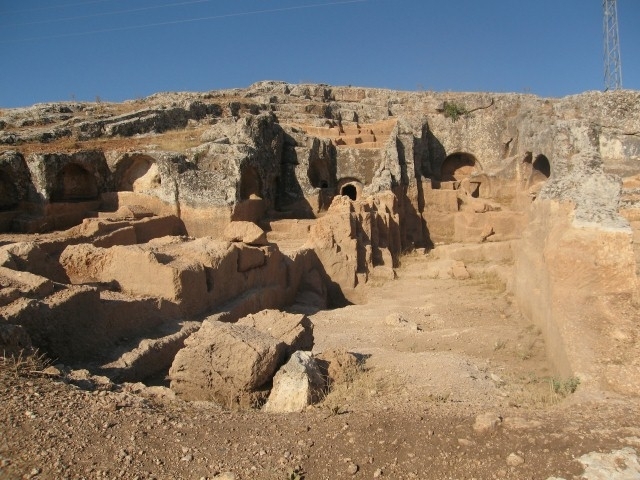 CNMP is an integral plan comprising Mount Nemrut Tumulus with fourteen other sub-areas. The name of the management plan is chosen with reference to Commagene as the plan covers an area which took place within the borders of Commagenian Kingdom, and most of the chosen fifteen assets and areas belonged to the Commagenian Kingdom period. CNMP is prepared considering that the conservation is not only a physical aspect but a social, communal and economical fact, it has aimed to assure sustainability in conservation, generate the social capacity and develop and maintain the region economically. In consequence the project will contribute to the social development requirements, development of organizational capacity, institutionalization, development of local production facilities, and by enhancing the production, local/social development and conservation process provide job creation. The vision of CNMP is defined as conservation through cultural tourism, improvement, development and sustainability. 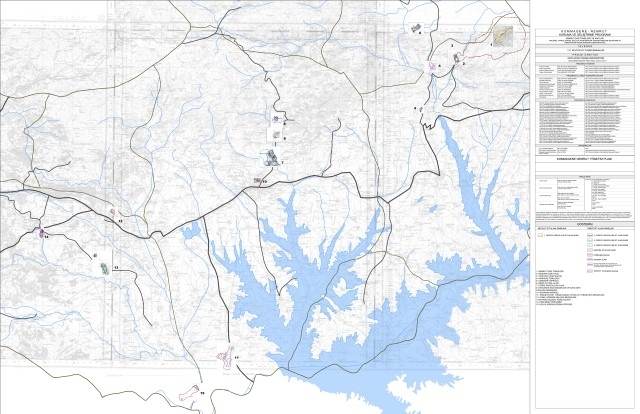 Based on the detailed analyses and evaluations about the fifteen places and the ownership statuses, new propositions for the protection boundaries are developed and these are shown on the 1/5000 and 1/1000 scaled maps of 2010. Also for the same fifteen places the buffer zones are determined and shown on the 1/5000 scaled maps. The buffer zone belonging to the said fifteen places are determined and shown on the 1/5000 maps. 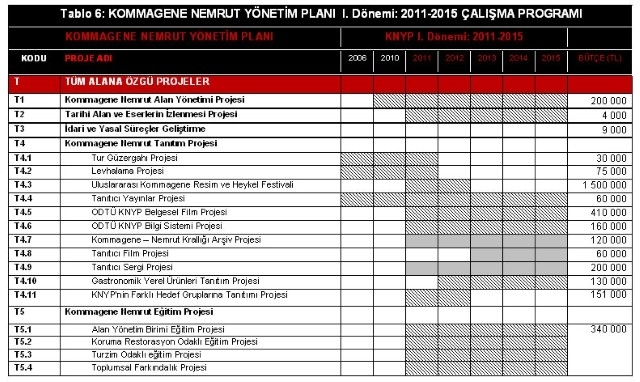 The plan comprising the entire Commagene Nemrut Management Plan boundaries is prepared as a 1/100 000 scaled map. c. The projects to be implemented locally. All the projects are entered into a table according to their relationships between the locality and strategy, and 1st, 2nd and 3 rd implementation periods are determined. According to this, the first period is between the years 2011-2015, the second period is between the years 2016-2020 and the third period is between the years 2021-2030. According to the legislations, the CNMP will be updated every five years. The projects to be realized in the first five years are determined and defined in detail in the CNMP action plan. In practice all projects defined in the CNMP Action Plan will be completed up to 2030. The projects which have a stronger pushing effect (like presentation, environmental design, restoration projects) are planned to be started or completed by the end of the first period. The projects planned to be implemented in the first five years are presented within a ‘scenario’. The spatial structure of this scenario is a ‘conservation-development road itinerary’. This road comprises the cultural assets to be protected and developed primarily. 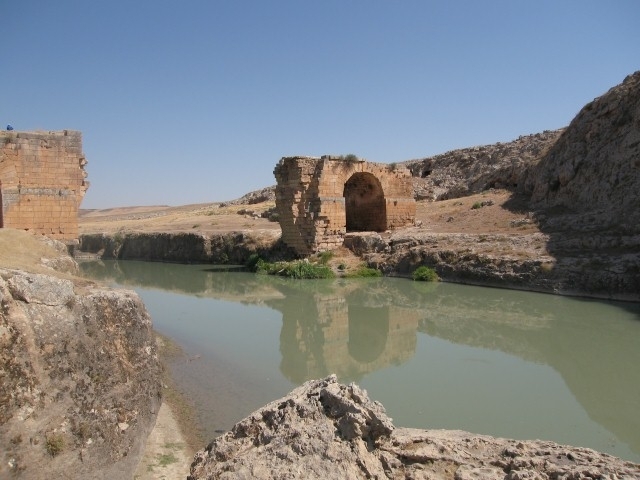 The conservation-development road itinerary handles the problems in the CNM area (like very low number of visitors compared to the other world heritage sites etc) together with the mission of tracking the traces of Commagene where the Euphrates unites the east and west, nature and structure and local and global. 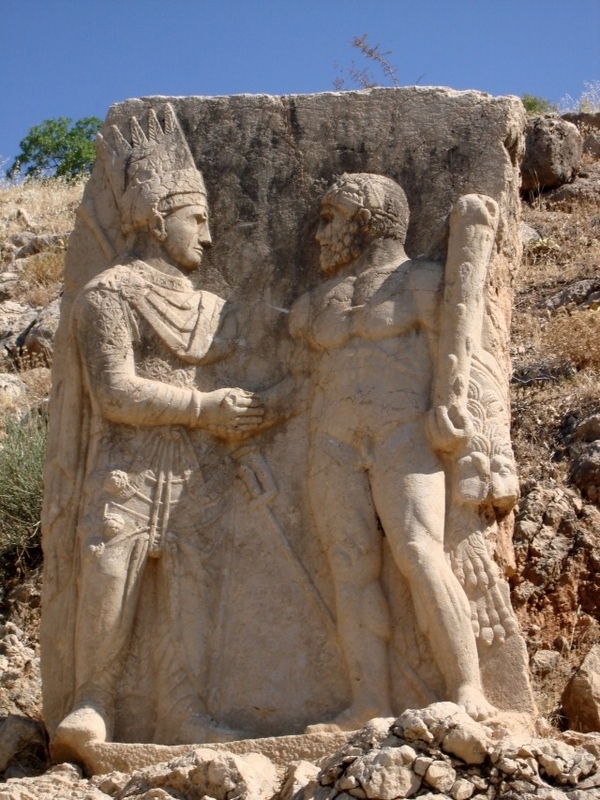 It has a specific route scenario comprising the other cultural assets in Adıyaman together with Nemrut. 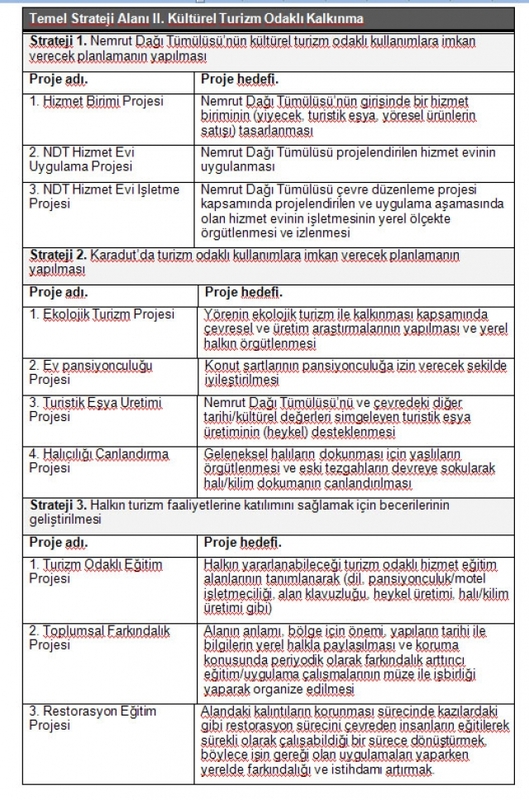 According to the results of this project, the management area can be enlarged towards other districts in Adıyaman or other cities in the vicinity (for example including Zeugma, Dülük/Doliche in Gaziantep) which were also Commagenian settlements. 4) The problems in implementing the activities and reasons of failure if there are. 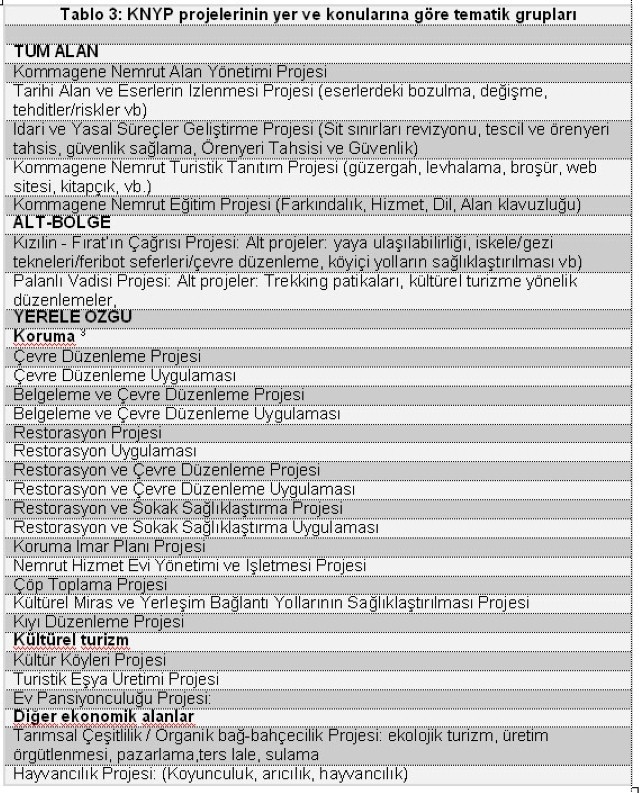 The distribution of all the projects in Adıyaman Province are shown on 1/100.000 scaled map: The Commagene Nemrut Management Plan – Spatial Strategy and Action Plan. CNCMP staff and submitted as annexes. 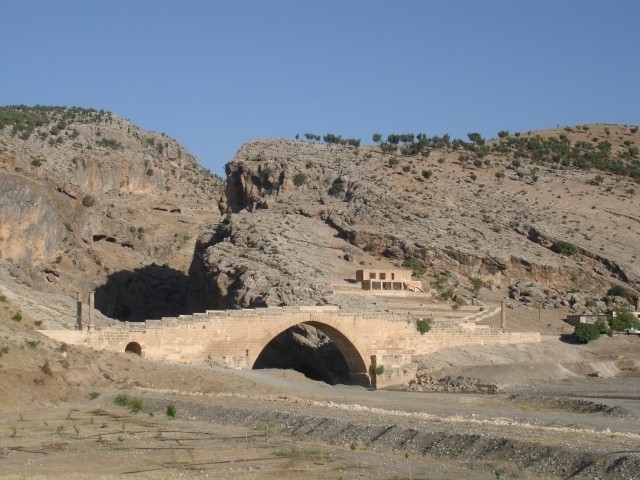 The main criteria in the ‘Commagene-Nemrut Management Plan – Site Management Project’ are stated so that the CNMP should constitute a participatory management mechanism which will permit all stakeholders in Adıyaman to implement, follow and evaluate the management. The Legal/Conceptual Ground: All actors who will involve in the CNMP are determined as defined in the related laws and regulations of the Ministry of Culture and Tourism. According to this, the Ministry will assign a site manager, his staff, and constitute a Coordination and Control Commission as defined in the legislation of site management. 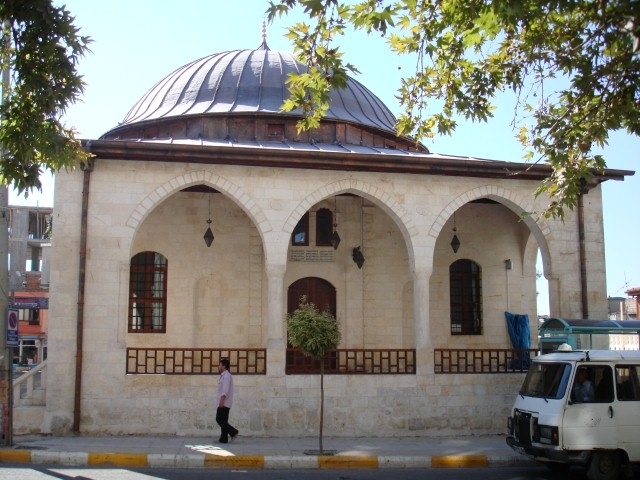 Again, according to the same laws, within the body of Adıyaman Special Provincial Administration, a Project Office will be established which will prepare and implement the measured drawings, reconstitution and conservation projects of the cultural assets, and an Educational Unit which will train certificated craftsmen. In addition to this, as decided in the local workshop held in October 2010 in Adıyaman in order to develop strategy/action plan, a local participatory platform will be established with the participation of local administrative officers and NGO’s which will form a basis to the Coordination and Control Commission, monitoring/evaluation and project planning/implementation processes and legal affairs. Main organs of the Management Plan Structure: The MP structure is composed of three main organs. 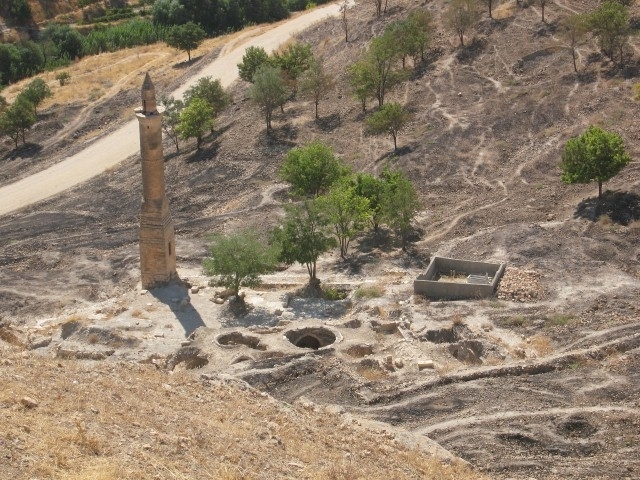 The Commagene Nemrut Area Management Unit (CN-AMU) which is the local unit of the Ministry of Culture and Tourism, working attached to the Governorship of Adıyaman, Adıyaman Special Provincial Administration, Project and Training Unit (ASP-PTU), and the Participatory Platform of Adıyaman (PP-A) which is composed of the representatives of Adıyaman Province and villages. The priority projects are determined according to the relations among one another and their power of impact and multiplier effects. 134 projects will be realized in the first five years of the 20 years Working Programme of CNMP. The environmental design projects which will have a strong multiplier effect are planned to be implemented in the first five years period of the CNMP. These projects are planned together with the Culture Villages projects aiming to raise awareness and increase the number of tourists. After this, the projects concerning agriculture and livestock take place. These projects aim to increase the variety of the products, develop suitable marketing and selling strategies, increase the production, thus create jobs in the region. In this way not only a tourism oriented development will be achieved but the protection and continuity of the local savors and specialties and a well-balanced development will be obtained by supporting the local production and related fields (like packaging, presentation and marketing). One of the priority projects of CNMP is the monitoring and training activities. These projects are important for tourism aimed services and production, and raising awareness. 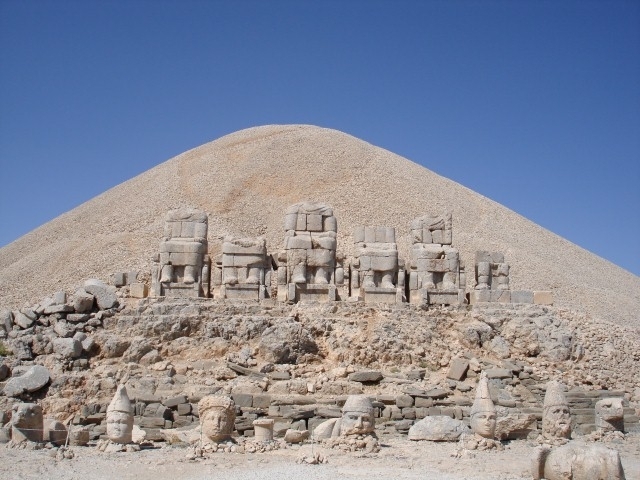 As is the case for Mount Nemrut Tumulus, in many other places also there is a need for qualified trained staff for various services and implementations. These projects comprise the training for the field guides, the staff who will work in the Visitors Houses and other tourism activities, and in more specialized areas like stone conservation. By this way the local staff will work with the specialized technical staff for five years and realize the monitoring of conservation implementations as well. 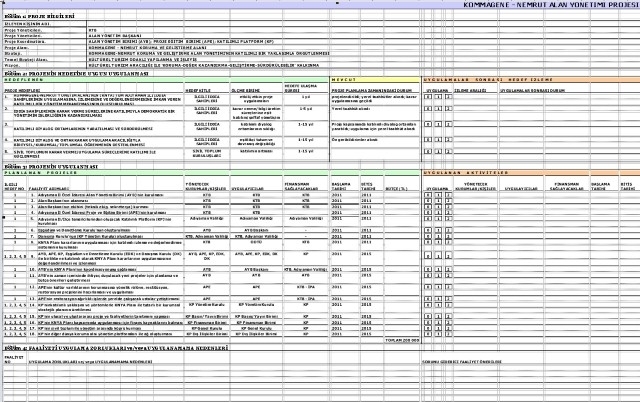 In this framework, the 114 of the 134 projects are defined and the action plans are prepared. In some of the projects, the main approaches to the project, preliminary design decisions or some documents like technical specifications are prepared and presented in addition to the project follow up forms. 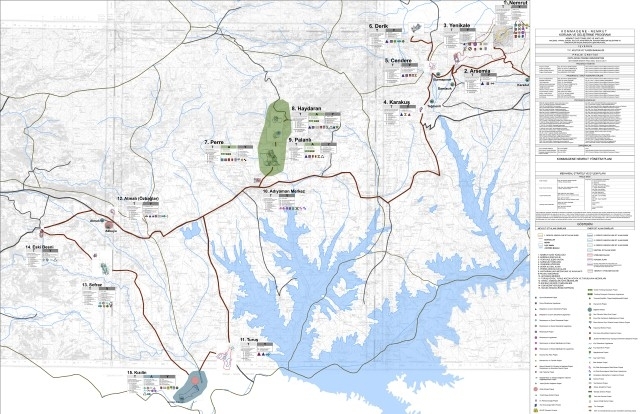 The cost estimates of the 114 projects to be completed in the first five years of the management plan are prepared and possible funds are indicated for the realization of these projects. A monitoring/evaluation mechanism is prepared for the CNMP which propose a process composed of different phases for different levels that will follow and control the application procedure. The realization and continuity of the CNMP will be achievable only if the monitoring and evaluation mechanism act together. During the monitoring and evaluation process, based on the problems occurred during the application, new paths will be determined and new targets and activities will be planned. In this way while assessing the application state, experience will be obtained for the next steps of the management plan. 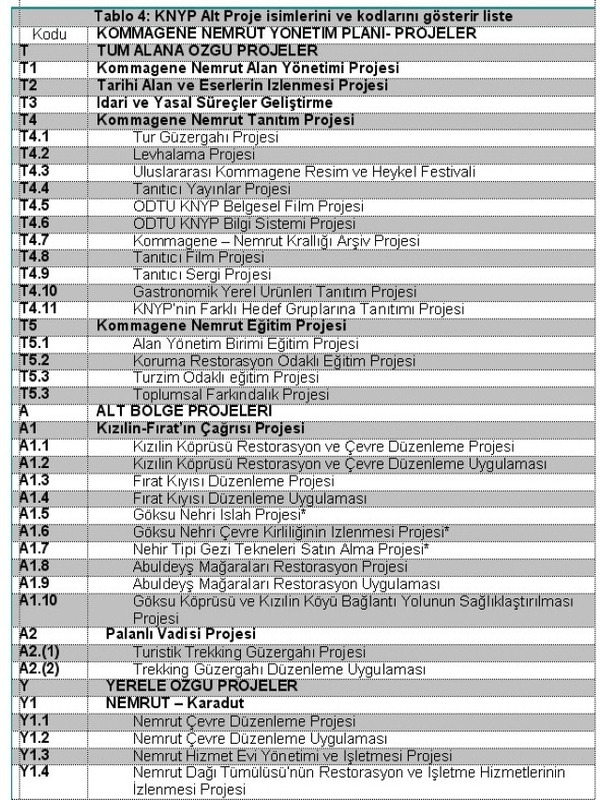 All CNMP projects are completed and submitted to the Ministry of Culture and Tourism in January 2011, and the revisions requested by the Ministry are completed in 2012. 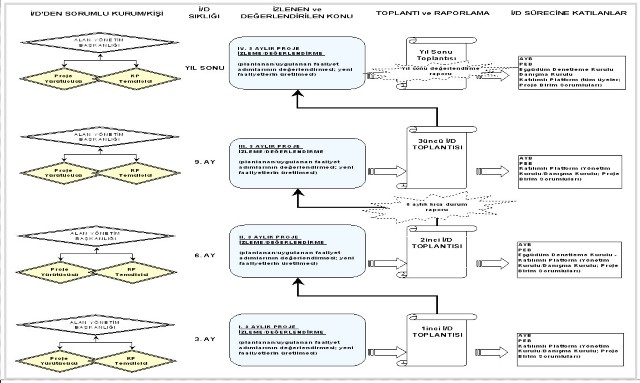 After this step, all digital maps showing the updated boundaries of the 15 zones forming CNMP were approved by the Şanlıurfa Conservation Council; later on CNMP borders have been submitted for the approval of the Ministry (7.06.2013 / 111 983). Afterwards, all documents related with CNMP and the boundaries approved by Ministry of Culture and Tourism were sent to the stakeholders and the institutions for their proposals and approvals. 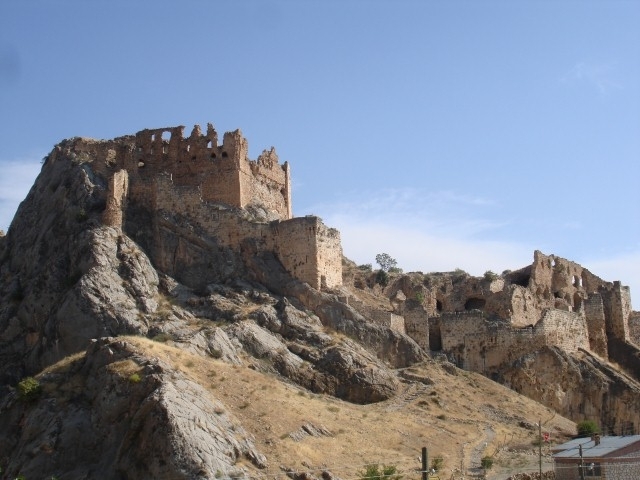 During this process, a Site Director is assigned and afterwards Commagene Nemrut Advisory Board and Commagene Nemrut Coordination and Supervision Board were constituted respectively. 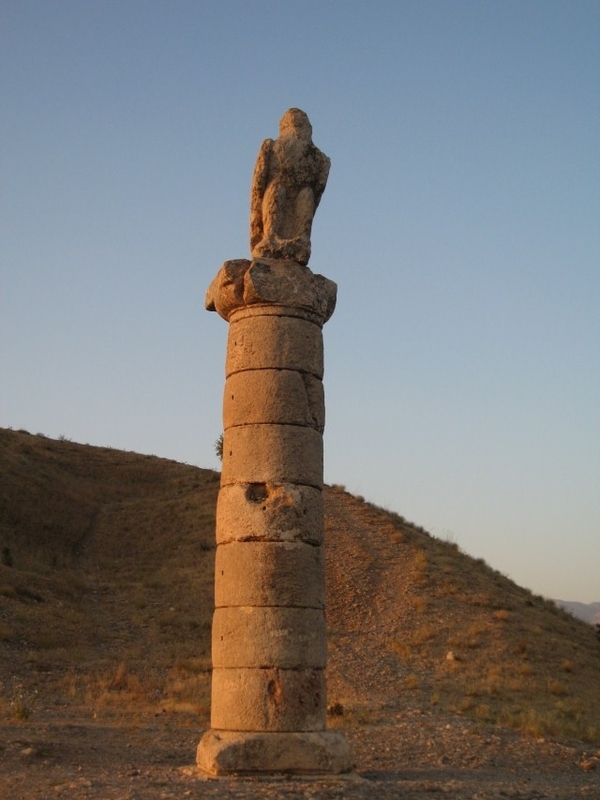 After a comprehensive assessment, CNMP was first accepted by the Nemrut Advisory Board in April 29, 2014, and then finally in June 25, 2014 was approved by the Commagene Nemrut Coordination and Supervision Board. 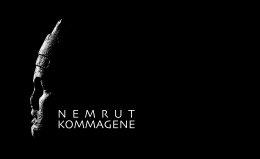 Thus since June 2014, Commagene Nemrut Management Plan (CNMP) has been put into action, and as METU CNCDP Team we are proud to announce that the Commagene Nemrut Conservation Development Programme (CNCDP) which is the result of a comprehensive, detailed and long-term work is completed as a whole.